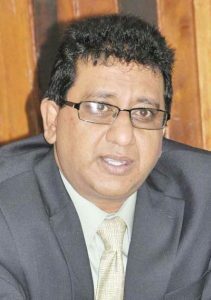 Opposition Parliamentarians, Anil Nandlall and Priya Manickchand, to ensure that the clarity requested by the Opposition Leader, Bharrat Jagdeo, on the Government’s interpretation of Article 161 (2), which speaks to the nominees for the appointment of Chairman of the Guyana Elections Commission (GECOM), is provided. During that meeting, the Opposition presented its own interpretation, along with what they believe to be supporting case law and statutes, which Minister Williams has undertaken to carefully examine before a second meeting is organised within one week. 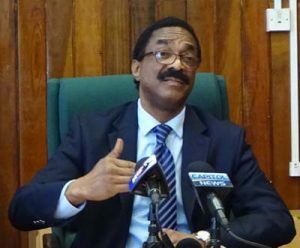 According to the Ministry of the Presidency, the meeting occurred at the AG’s office and was conducted as mandated by President Granger, who on January 19, said that the most efficient way to ensure legal clarification on the requirements for the appointment of a Chairman of GECOM, would be for legal representatives of the Opposition and the Government to meet to discuss their interpretations of the Article. “I invited Mr. Nandlall to present their position and he did that relying on several cases and statutory authorities… Now, after they were complete, in order for me to treat properly with his submissions, I would be required, as in any court, any judge would have wanted an opportunity to read the cases that Mr. Nandlall cited and look at the statues that he mentioned. “It would not have been propitious to do that at that time so we’ll have to gather in the authorities, read them to see whether what he is saying is coincident with what the authorities are saying,” the Ministry quoted the Minister as saying. The Attorney General noted that that while the Government has already established its position it will carefully examine the points, which have been put forward by Nandlall to ensure that the interests of the country are protected. “I could have indicated to him when you look at the provisions, one “there shall” – it’s mandatory; it tells that you must first look at the mandatory provisions, which deal in descending order: judge, retired judge, person who could be appointed a judge, who is qualified to be a judge and…any other fit and proper person. “I could have done that and said, ‘Well I don’t agree with your interpretation but I’m doing better than that because it’s not a question of Mr. Nandlall and me. It’s a question of the people of Guyana and the question of the proper law to be applied for the future in relation to these matters,” the Attorney General noted. Minister Williams noted that during the course of the meeting, Manickchand did, however, concede that it is the President’s prerogative to determine who is a ‘fit and proper’ person, in keeping with the provisions of the Constitution. Nandlall in a Facebook post, stated: “Today (Wednesday), Priya Manickchand, Attorney-at-Law and I met with Attorney General, Mr. Basil Williams, pursuant to a proposal made by President David Granger to Leader of the Opposition, Mr. Bharrat Jagdeo, to discuss the appointment of a Chairman of Guyana Elections Commission (GECOM). Nandlall stated that the AG was ‘unprepared’ to put forward his or the government’s interpretation of Article 161 of the Constitution, despite several requests for him to do so. “Instead, he indicated that he will need time to interpret our contentions and prepare his response. All of the interpretations offered by us today were fully and publicly ventilated in the media. The meeting ended with the Attorney General being unable to identify another date available in his diary for us to meet again.” Nandlall’s post read. It further stated, “I am disappointed by the lack of preparedness of the Attorney General, which resulted in nothing tangible emerging from the engagement. Moreover, the Attorney General could not even identify a date for our re-engagement. Quite frankly, I was hoping that the Attorney General would have been ready with his position on the matter today; that may have resulted in this matter being concluded with dispatch and decisively. In the meanwhile, Guyana’s democracy continues to hang in the balance. Nandlall has since written to the AG requesting an earliest possible date for the next meeting.